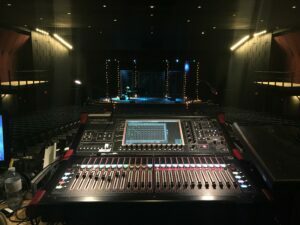 I had the fantastic opportunity to shadow Chez Stock who is the Tour Manager and Front of House sound engineer for singer-songwriter Amanda Palmer. SoundGirls had promoted this opportunity, and I applied to shadow Chez when she came through Toronto on tour. I wanted to share my experience of my day with her to shed some light on the value of these opportunities. Chez invited me to the 2 pm load in time, so I found my way down to the Queen Elizabeth Theatre. I arrived with my thirst for knowledge, trusty multi-tool and overwhelming garlic breath (should not have had that hummus for lunch…). I quickly found Chez and introduced myself, hoping my breath didn’t offend her. Chez introduced me to other members of the crew (touring and local) before she had to run off to handle something merch-related. This was my first glimpse at just how much work it is being a Tour Manager (TM) and Front of House (FOH) at the same time. 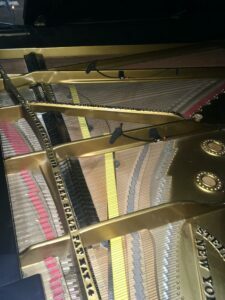 When Chez and I re-connected, she showed me how she mics the grand piano, outlining the mics she uses and why and the importance of placement in achieving the best sound. 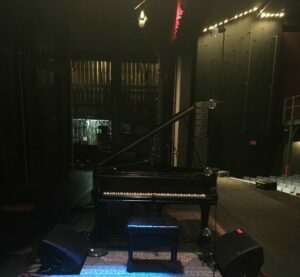 This tour had a fairly simple set up of a grand piano, vocal mics, and a ukulele mic/DI. When Amanda arrived, the crew had to make some minor adjustments to the positioning of the piano. Chez then had a chance to go up to FOH and take a listen to the PA. She played some of her reference tracks and showed me how she tunes the system. Chez was able to get what she needed through a quick sound check as Amanda had to leave for a pre-show event. Not before heading back to her Tour Management duties, Chez had to deal with a rattle in one of the keys in the piano. With 2 hours to go before showtime, Chez arranged for the piano tuner to come back and fix the issue. Handling these sometimes intense, last-minute problems is just another one of her many amazing skills! After sound check was complete, the crew took a dinner break. Except for Chez – she still had incoming merch to deal with among other things before doors opened in 2 hours. 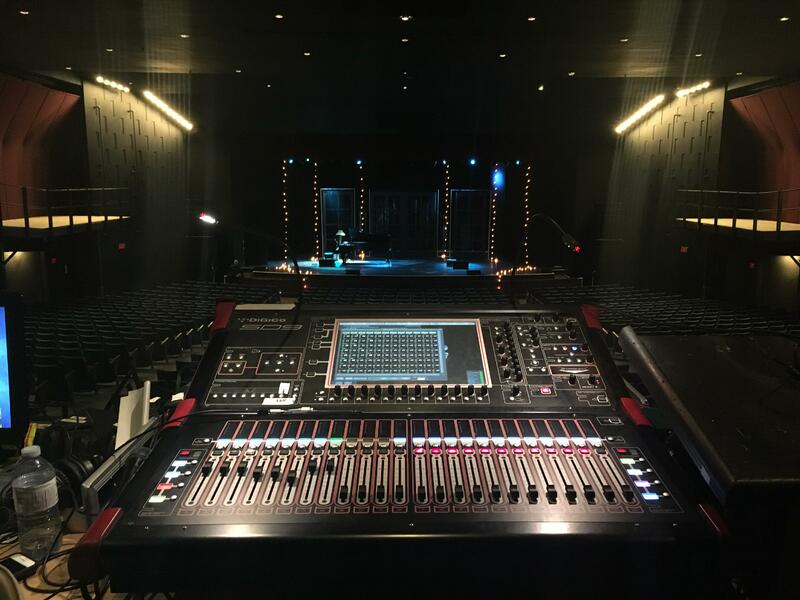 During this time, I was able to observe the lighting designer, Lauren as she also worked through the break putting the final touches on her lighting set up. As I watched Lauren, I caught glimpses of Chez running around like a superhuman, dealing with all the pre-show loose ends. I was fortunate enough to be able to stay through the whole show and sit behind Chez at the mix console. Watching her perform an artful blend of technical skill and musical ability was an incredible testament to her dedication to her craft. During the show, she had to be FOH and TM – mixing and dealing with issues that came to her. Again, she calls on her multitasking versatility when Amanda asks about the heating on stage as it was quite cold. Without interruption to the performance or her duties as an engineer, she succeeds in contacting the venue staff to get the heat going onstage. Chez’s ability to keep the show sounding great while dealing with these hiccups all without the audience being aware of them was remarkable. After the show ended, I was tasked with dismounting the mics from the piano and packing them away. After that, I tried to help out the crew as much as possible as Chez continued her Tour Manager duties. At the end of a long day, an exhausted Chez took the time to answer more questions I had and offer advice. We then said our goodbyes, and she continued to pack up before heading to the hotel where she would hope to get a couple of hours of rest before moving on to the next city. Having the opportunity for some hands-on experience makes a huge difference. It’s one thing to read about the technology and techniques involved but having hands-on learning really solidifies the knowledge in a way that classroom learning can’t. Shadowing opportunities like this are so worthwhile, and I thank Chez for offering her time and knowledge to those of us looking to learn. What can you do to get the most out of an experience like this? Be quiet and observe. These professionals have a lot to deal with already so give them their space and don’t disrupt them. You are a shadow, so be in the background and learn from observation as much as you can. Ask questions at appropriate times. Again, try not to derail their workflow. Write down your questions somewhere and ask them when your mentor has the time or when they offer to answer questions. Offer assistance and always ask before doing. Don’t start touching gear or moving cables. You don’t know what is needed and you will get yelled at. Rather than jumping in, ask if/how you can help your mentor. Stay in touch. Your mentor may be willing to offer advice and information post-mentorship. If you’ve been able to make a good connection with them, ask if they would be willing to stay in touch. 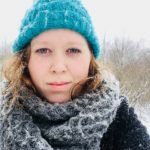 Chelsea Body is a freelance sound editor and foley recordist based in Toronto. 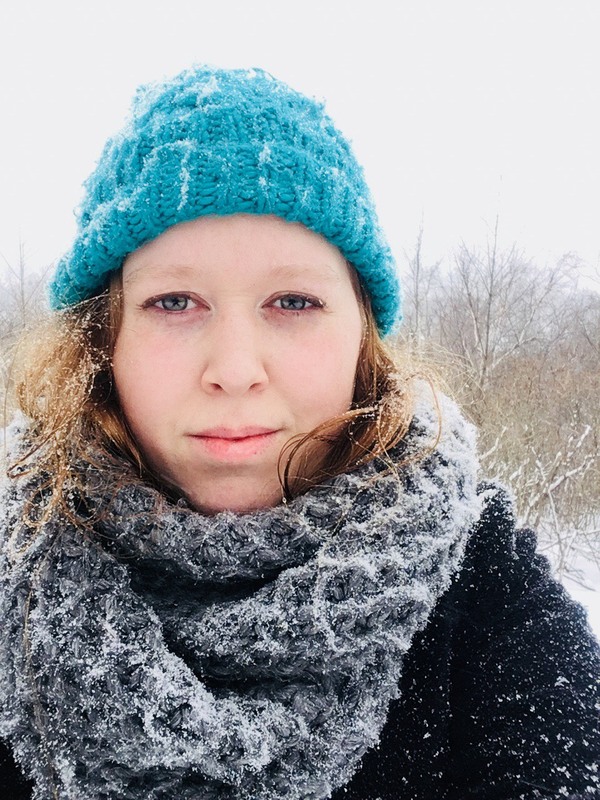 She is a graduate of the Audio Post Production and Music Industry Arts programmes at Fanshawe College and is currently a Foley Editor and Operator at Footsteps Post Production.